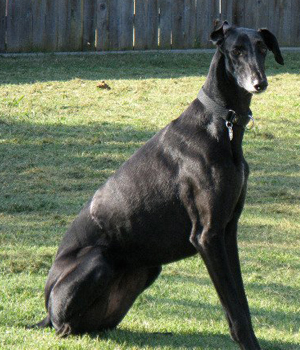 Ella is one of 9 greyhounds GALT received from a Fort Worth Animal Control cruelty case. 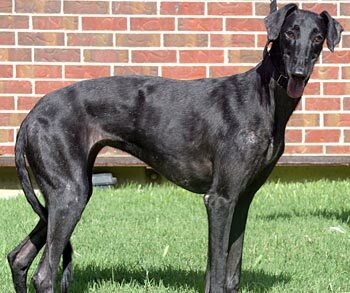 Ella is a beautiful black girl estimated to be approximately 2-3 years old. 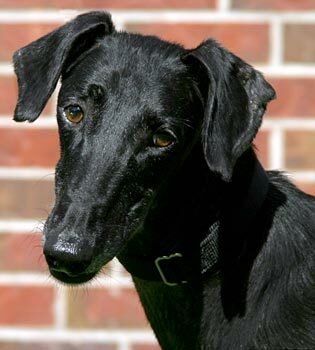 Just like the other rescued dogs, she arrived positive to babesia as well as ehrlichia. After extensive treatment, Ella has tested PCR (polymerase chain reaction) negative to all tick borne diseases. She is also heartworm negative at this time. In September Ella had two lumps removed that were diagnosed as malignant mast cell tumors. Dr. Jennifer Wiley of the Veterinary Specialist of North Texas & Animal Cancer Center saw Ella, and her evaluation shows the tumors were completely excised with clean margins. The mast cell tumors were low-grade (2) and are unlikely to spread. Per Dr. Wiley no further treatment was required, and Ella can look forward to a normal life span. Any future lumps should be promptly evaluated. It is not known at this time if Ella is small animal or cat tolerant. This Friday, the first of the GALT dogs from the July 8th FWAC seizure will go to a forever home in California! Ella will be living in the same house as Bessie - a recently adopted puppy from the August 10th FWAC seizure. It has taken over four months and $2400 for Ella to be ready for adoption, and she is just one of the dogs rescued from tragic conditions. It has been a long haul for the surviving dogs, and Nicole and Pico are still on the road to recovery at this time. Thankfully, Max, Nate and Charlie are ready to find their forever homes and hopefully will be adopted soon. We know that Pudge, Rachael, and Martin are looking down from the Rainbow Bridge cheering for all of them.